Designed to reduce the federal deficit, the Budget Control Act of 2011 placed strict, austerity-level “sequestration” caps on federal spending when Congress failed to develop a responsible plan for reducing the national budget. The caps are not a legitimate, thoughtfully designed policy suggestion, but rather a fallback budget mechanism—a blunt instrument that ignores current national threats and opportunities, and does not account for the strategic interests of our nation. Historically, Congress has been aware of this issue and responded accordingly, acting every two years to modify the Budget Control Act and increase the level of discretionary spending appropriated each year. More information about the Budget Control Act—and the semi-annual repeal process—can be found here. After the last two-year reprieve, these sequestration budget caps threaten to return in full force. Absent another budget deal, non-defense discretionary spending must be cut by $55 billion in FY20, and defense spending must be cut by $71 billion. Cuts of this magnitude will slash the budgets of science agencies and Defense research operations alike, threatening American scientific discovery, innovation, and medical progress. It’s not smart, or right, for Congress to let caps from the past undercut science for our future. Research!America stands committed to defending the budgets and operating power of America’s world-class, federally-funded research institutions. Together with a wide-ranging collection of allies—patient advocates, scientists, research institutes, pharmaceutical leaders, scientific societies—we’re launching our 2019 Raise the Caps campaign. Once again, a cross sections of Americans, whose lives are touched everyday by science, are coming together to call on Congress to raise the budget caps, stop stifling innovation, and fund science. But we can’t do it without you—we need your help to make the case to Congress that Americans believe that science is worth funding, and that the caps need to be raised. Push out this Raise the Caps (RTC) landing page (http://www.researchamerica.org/raisethecaps) to your networks. This page includes links to a petition, a social media toolkit and other key advocacy resources. Sign the petition via by clicking the “Take Action” button on this page (http://bit.ly/raisecaps2019) and encourage everyone in your network to do the same. Tweet to your representatives in Congress via the “Take Action” button on this page and keep tweeting. Use the hashtag #RaisetheCaps and be sure to tag @researchamerica. Email your members of Congress via the “Take Action” button on this page. Share your ideas with us – what are your top five reasons to raise the caps and increase science funding? What does the future hold if we falter in science investment? Have you seen compelling visuals making the case for funding science? Pass them along. The RTC Campaign will be more successful if you lend your creativity and strategic thinking to it. 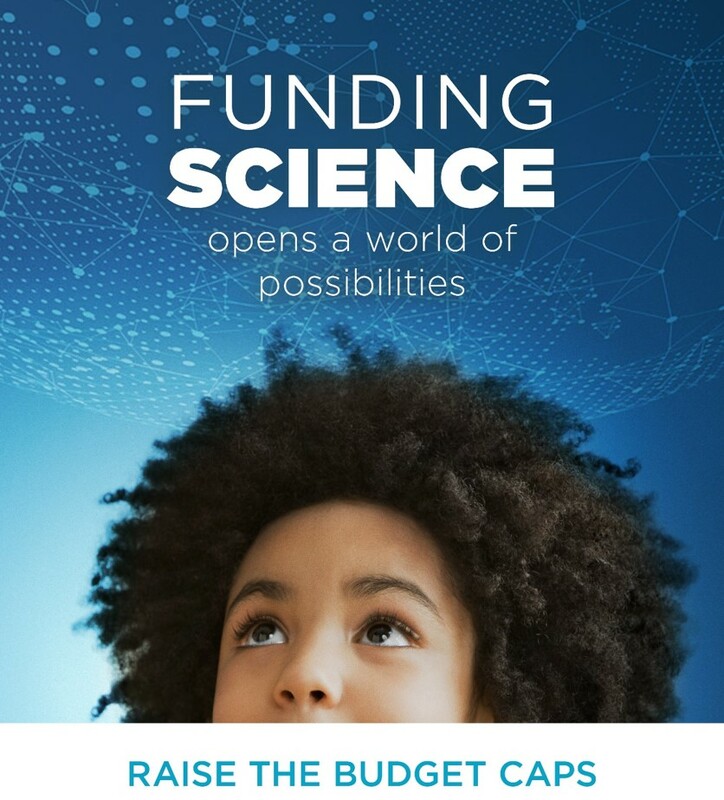 Together, we can raise the budget caps and reinvigorate science funding.